The United States is a unique place in that it allows citizens and residents to own firearms, whether guns or rifles, a liberty that goes back to the very founding of the country. However, that does not mean that a private firearm owner can just go running around doing as he or she pleases with his gun. Jurisdictions and municipal governments like Austin have passed dozens upon dozens of rules and regulations regarding firearm usage, and states have added their own layers on top of them. Violating any of these laws would be considered a criminal matter. Every year there are cases where local governments have out-stepped their bounds and passed something that conflicts with the second Amendment, the Constitutional right to bear arms. But for those laws that stick, that means any firearm owner anywhere in the country is subject to a handful of gun rules right away no matter where he or she happens to be. Ironically, it is law-abiding gun owners who find themselves, more often than not, running into minor infractions or mistakes with the law. This is because criminals do not really care about the proper procedure on how to transport a firearm, licensing, storage or similar issues. They just run off and commit their crimes and dump the firearm used, only to buy a new stolen gun by means of an illegal sale for the next crime. Unfortunately, the justice process seems to have a hard time discerning the difference. They find a person whom it seems has triggered a violation, and then the person is subject to the full extent of the laws which are supposed to be controlling the actions of criminals. And, charges with a firearm, due to the actions of violent criminals, are typically severe because they have been written to as a deterrent for such people. Again, however, it is good firearm owners who are repeatedly harshly penalized for making a mistake and become caught up in bureaucratically driven laws. And, this can mean the loss of a job, income and even one's home as a result of the related consequences. Fortunately, the justice system is also required to allow for a legal defense due to the Constitution and the right of due process, which is the primary opportunity for a defendant to clear up the circumstances regarding the violation and to remedy overzealous charges that may not apply to the given situation. But not just any attorney can handle a firearms case successfully. What a person in with firearm charges that may not be in accordance with the second amendment needs is a qualified, experienced weapons dispute lawyer who knows both federal and state gun laws as well as local ordinances. Who Handles Firearms Cases in Austin, Texas? 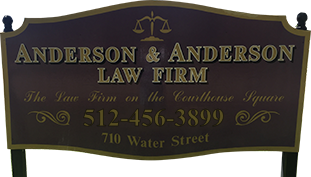 If you need a firearm attorney in Austin or a second amendment lawyer in Bastrop, then you need to call or email Anderson & Anderson Law Firm. They are experienced, well established criminal law attorneys serving the greater Austin, TX area with a deep knowledge of the local court processes. This is critical because half of a criminal defense has already occurred in the procedural phase before charges ever arrive to a trial. If you need quality representation due to a firearm issue or related charges, don't hesitate to contact Anderson & Anderson. Your liberties matter and that means the right legal expertise is a necessity.